Baby Let's Play House. I'm Left You're Right She's Gone. (US) SUN 217 (78/45) Released: May 9, 1955 Recorded: Sun Studios, Memphis, February 1, 1955 Recorded: Sun Studios, Memphis, March 5, 1955 This is an original pressing from Sam Philips Sun Studios Memphis. The record is in superb condition other than having a crack on the left side looking at the picture but still plays I have only played it once then framed it for my collection. This is a very rare record and a piece of history. 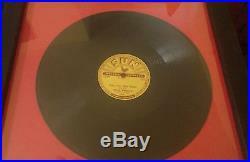 The item "Genuine Elvis Presley Sun 78rpm record" is in sale since Monday, May 02, 2016. This item is in the category "Music\Music Memorabilia\Artists/ Groups\Elvis". The seller is "captaincrunch26" and is located in Cumnock. This item can be shipped worldwide.